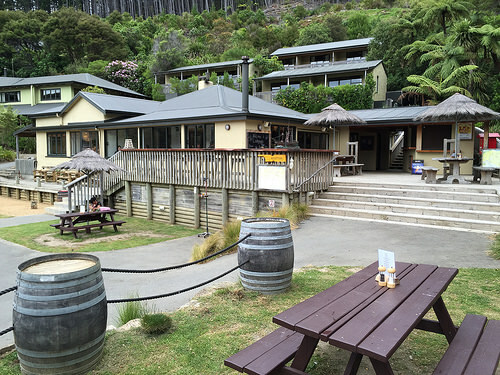 If you’re visiting Lochmara Lodge from Picton, you’ll only need a 15 minute ride by water taxi to get there. The water taxis leave from the main wharf. They are in fact the easiest way to explore the Marlborough Sounds. They’re also the ideal transportation if you’re time-short. The water taxis leave the Picton Wharf for Lochmara Lodge at 9am, 12.15pm and 3.15.pm. I would recommend that you go in the morning or take the midday water taxi. That way, you’ll get plenty of time to check out this unique property. Lochmara is set right on the waters edge in the Marlborough Sounds in Lochmara Bay, Queen Charlotte Sound, Picton. You won’t find any roads here. That’s a comforting for people with small children. If you’re staying at Lochmara and you want to visit Picton, you can. For a small charge, water transport can be arranged. Lochmara is great for families who love the outdoors. It has a 3.5km walking track leading to the stunningly beautiful Queen Charlotte Track. I found the staff to be pretty friendly. They’re happy people and quick to smile. Getting a great welcome really does set the tone for a great stay. I think most travellers would be impressed with Lochmara’s well planned layout of the property. Families with children would have no trouble negotiating the clearly defined pathways. The property’s large map and and signage make it easy to explore the entire property. In fact, most of the paths can easily be walked in 1-2 hours. You can also access the Queen Charlotte Walk from Lochmara. However, do bear in mind, this particular access is rather steep. The Lochmara property is perfect for families looking for the unusual. 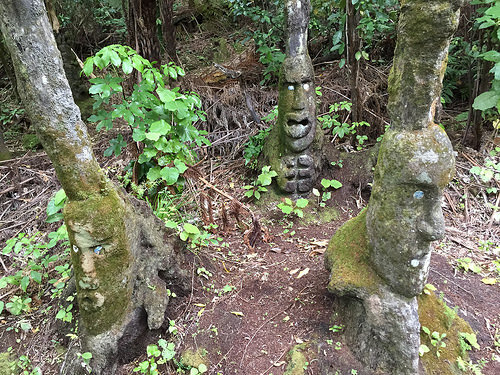 There are different features like the Glow Worm Gully, Huia Art Space, Flying fox and the “Punga People” – now, they’re pretty cool! 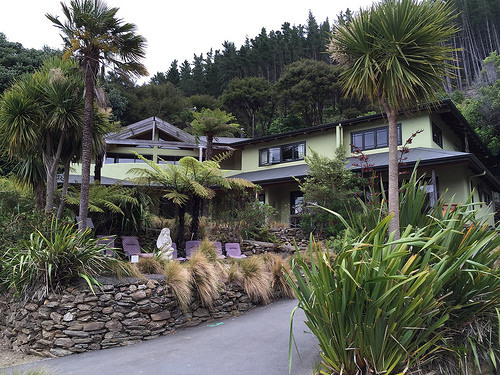 If you’re visiting Lochmara Lodge from Picton and staying overnight, you won’t go hungry. At an additional cost, breakfast, lunch and dinner are served here. The complimentary kayaks are available to explore the shore of the Lochmara arm of the Marlborough Sounds. 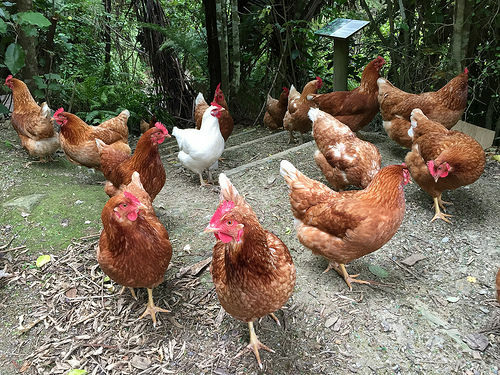 Lochmara has a wildlife recovery programme, a bird aviary plus chicken + pigs. This is a fascinating experience for everyone – not just children. Overall, Lochmara provides an easy access to explore the Marlborough Sounds in a limited time. 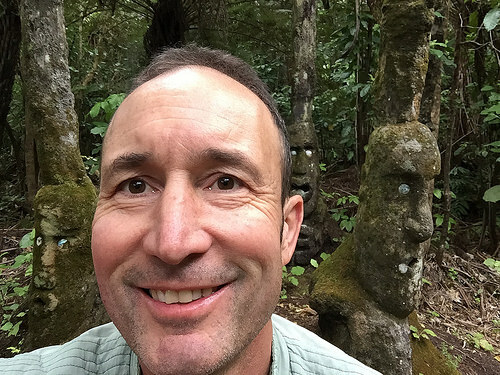 And if you do decide to visit, don’t forget to take a ‘selfie’ with the Punga People! Good job we KNOW that’s the wide angle doing that to you. Stunning place it looks. I call it the looking-into-a-teapot shot and incredibly unflattering..but he insisted! 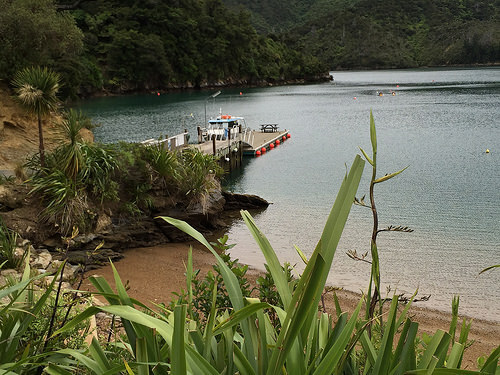 Love the Marlborough Sounds – had forgotten what an outdoorsy paradise it is.